Nuuk Cathedral (also known as the Cathedral of Our Savior or Annaassisitta Oqaluffia in Greenlandic) is a Lutheran church in the heart of Old Nuuk. With its red wooden exterior, neat white trim, and towering spire, the building is a local landmark and peaceful stopping point on a stroll through Nuuk’s city center. Built between 1848 and 1849, Nuuk Cathedral has been a city highlight for more than a century. Stop by on a self-guided stroll through the city center to appreciate its picturesque location and peaceful, wood-paneled exterior. On a hill above the church, there’s a statue of Lutheran missionary Hans Egede, a replica of the statue that once stood in front of Copenhagen’s Marble Church. Nuuk Cathedral is a must-see for history buffs and peace-and-quiet seekers. Remember to be respectful inside the cathedral. The hill above the church is a good spot to take photos of the structure and surrounding neighborhood. Nuuk Cathedral is located next to Colony Harbour in the heart of the city’s Old Nuuk neighborhood, roughly 10 minutes by road from Nuuk Airport. While public transportation is limited in the city, rental cars and taxis are available. You can visit Nuuk Cathedral year-round, although summer’s extended daylight and warmer weather makes it the best time to explore. On National Day (June 21), citizens gather around the church to celebrate. Greenland’s capital city is known for its rich cultural heritage and rugged nature. 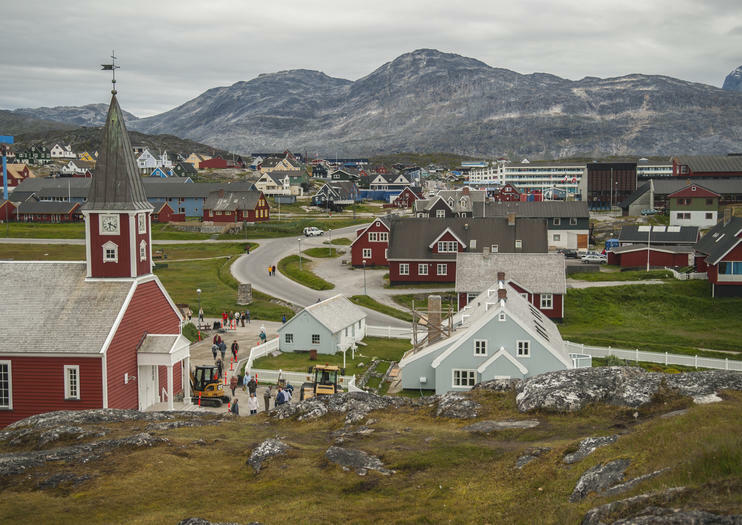 After you stroll through Old Nuuk and visit the Cathedral of Our Savior, stop by the Greenland National Museum, Katuaq arts center, or Nuuk art museum. You can also explore Nuuk fjord on a boat tour, a private glacier cruise, or an ice fjord hike. During winter, a nighttime ocean cruise is one of the best ways to see the famed Northern Lights.